Spray 3 1/2- to 4-quart slow cooker with cooking spray. In slow cooker, place potatoes, carrots, onion and bay leaf. In shallow bowl, mix flour, salt and pepper. Add beef pieces; turn to coat both sides. Spray 12-inch skillet with cooking spray; heat over medium-high heat. Add beef and brown on all sides; place in slow cooker. In small bowl, mix 1 1/2 cups of the broth and the Worcestershire sauce. Pour over beef. 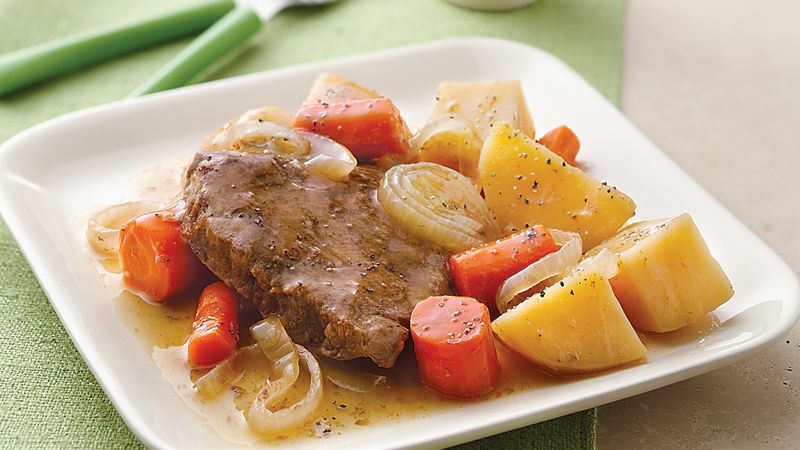 With slotted spoon, remove beef and vegetables to serving platter; cover to keep warm. Pour liquid from slow cooker into 2-quart saucepan; discard bay leaf. In small bowl, mix remaining 1/4 cup broth and the cornstarch until smooth; add to liquid in saucepan. Heat to boiling over medium-high heat, stirring constantly. Boil 1 minute. Serve sauce with beef and vegetables.